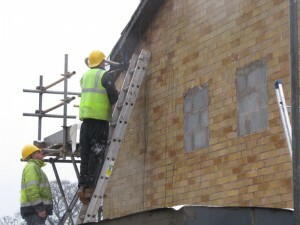 The cavity wall insulation (CWI) has now gone in. Primarily, it will be the external wall insulation that will be providing the heat loss reduction and achieving our U-values of <0.14 W.m².K. However, in order for the external insulation to be effective, we need to fill the cavity as best as possible to minimise/eliminate air currents. Otherwise, warm air entering the cavity will rise out at the cavity head to atmosphere, bypassing the external wall insulation. The picture above right shows the insulation being injected above the ceiling line of the top floor (usually installations stop just above ceiling level). This is in order to reduce air currents all the way to the cavity head. We have selected Platinum Ecobead as the CWI insulant. These are expanded polystyrene spheres that are injected at high pressure into the cavity – the manufacturer’s claim this totally fills the cavity, which is good. It is also blown with an adhesive, which means that the beads will stay in place, and not slump, when it dries. 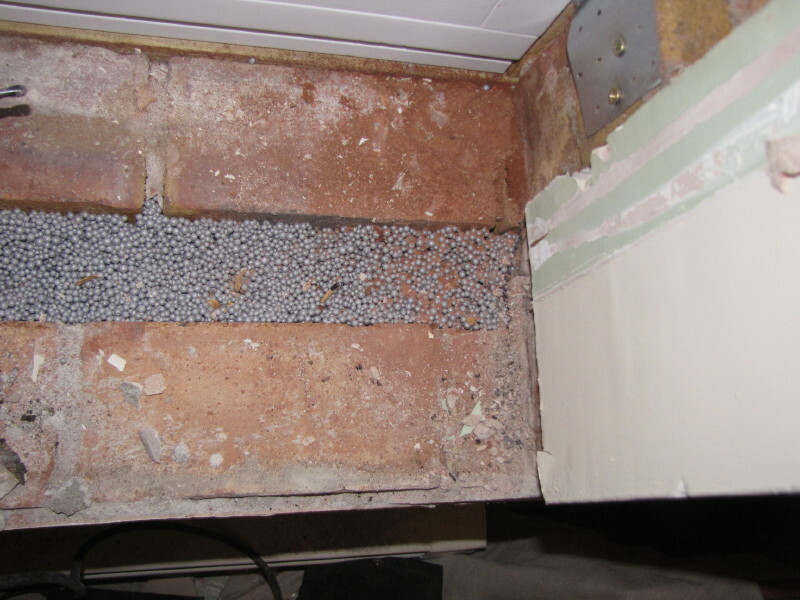 As we are replacing the windows and sills, a few days after the CWI installation, we get a unique opportunity to look inside the cavity to see how well the Ecobead has filled it. I am impressed! This entry was posted in Renovation and tagged Air leakage, cavity wall insulation, Insulation by admin. Bookmark the permalink. I will also take some thermal images shortly to see a bigger picture. The CWI guys have to come back to finish one of the gables, so will get the IR survey done so they can infil any thing that I pick up. Hi, great job on the house, looks really well done. Question: did you not consider leaving out the CWI and instead sealing the cavities at the top, maintaining the air gap between the inner and outer leaf? 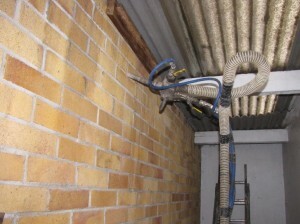 If you EWI over the wall and over the roof as well as many retrofits do, is it still required to fill the cavity? The cavity would then be open into the thermal envelope, so this wouldn’t then be a problem would it? I guess the stack effect within the cavity leads to convection currents and heat escaping. Is there such a thing as a 100% sealed cavity? I doubt it. Filling it seems wise if it would otherwise open outside of the envelope. Hi, great blog. Can you provide some details about how the EWI comes up and over the external leaf and meets the CWI, and how the cavity is sealed? My understanding is you have a cold loft, so wondered how you both air sealed and removed any thermal bridging.